Much of the buzz surrounding the upcoming Far Cry: New Dawn has been about the game’s pretty postapocalyptic setting. Unfolding 17 years after Far Cry 5‘s catastrophic conclusion, the spin-off’s substantial passage of time has allowed it to forgo the familiar dark and dreary end-of-days environments in favor of blue skies and bright foliage. 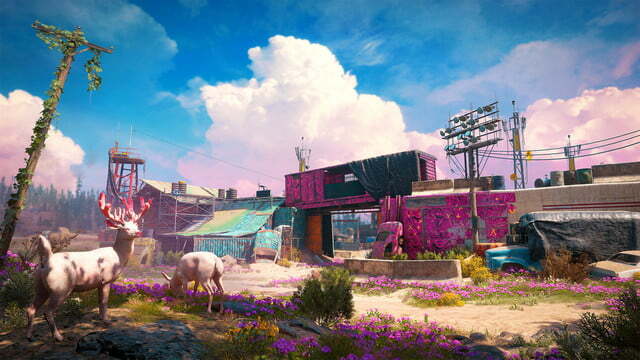 Based on our recent hands-off demo at Ubisoft’s Montreal studio, however, it seems New Dawn‘s doing more than painting the apocalypse with a vibrant color palette. While it’s not rebooting or significantly evolving on the franchise’s time-tested formula, it is adding enough interesting tweaks, fan-pleasing refinements, and inspired features to make it feel much more substantial than a Far Cry 5 expansion. All the game’s weapons and gear sport super-detailed, makeshift looks, not unlike the cobbled-together hand-cannons of the Metro games. Guns are made of scraps and junk – everything from pipes and duct tape to random pieces of plastic and metal – complete with kitchen knives serving as bayonets. Beyond the cosmetic appeal of these DIY creations though, many of their individual pieces are actually performance improving upgrades. During our demo, for example, the protagonist – an unnamed character brought in to help rebuild Hope County – tackled a mission that’d ultimately see them discovering valuable upgrade resources. 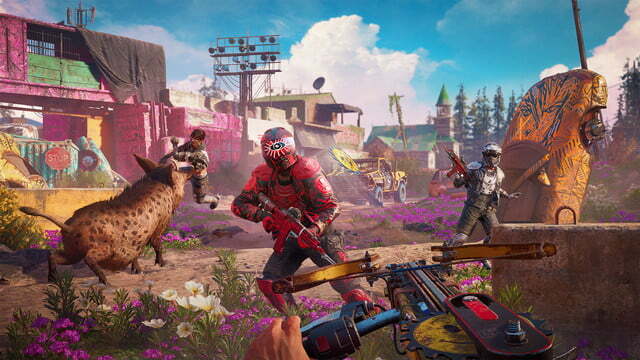 Showcasing another of the game’s cooler additions, the loot-gathering quest didn’t take place in Hope County, but in an old Louisiana amusement park. All the game’s weapons and gear sport super-detailed, makeshift looks, not unlike the cobbled-together hand-cannons of the Metro games. New Dawn introduces Expeditions, objectives far from the main Montana map that can be reached by helicopter. These off-the-beaten-path excursions, which will also take players to Arizona and California, promise to feature vastly different environments, all with unique biomes. In the case of our demo, we were treated to a sprawling stretch of Louisiana swampland – and the crocodiles within it – as well as plenty of rundown theme park rides. On top of featuring some fresh sights and non-Montana wildlife, the area was protected by a fresh enemy faction. 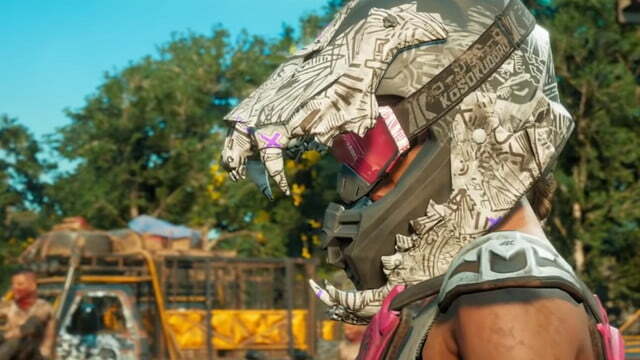 New Dawn‘s primary antagonists are the Highwaymen, an unsavory crew that’s transformed old motocross gear into armor, while apparently decorating their helmets with the skeletal mandibles of sharp-toothed beasts. The Highwaymen back up their menacing look by also being difficult to take down. 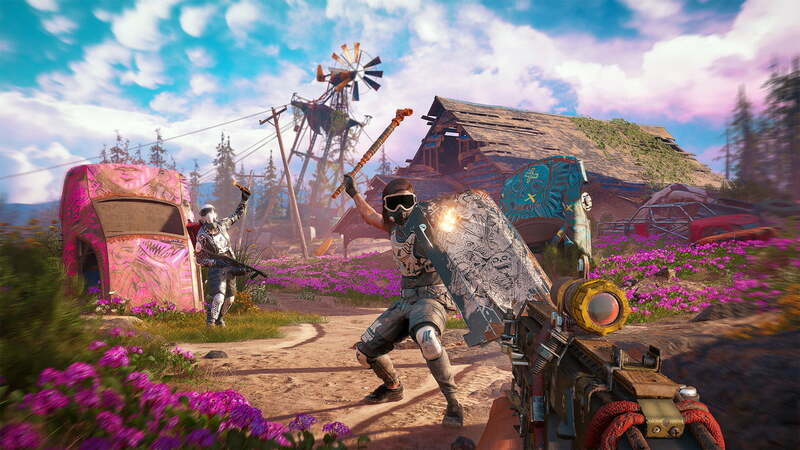 Noting that well-armed players could too easily blast through baddies in Far Cry 5, the developer’s introducing enemy tiers in New Dawn. Lower level threats will still serve as bullet fodder, but those higher on the henchmen food chain – including bulky Enforcers – will be able to absorb more damage. We didn’t see these bigger brutes in action though, as our preview session saw a skilled sniper eliminate most threats from afar. Specifically, the player was accompanied by Nana, a sharpshooting grandma that serves as one of the game’s new Guns for Hire. Speaking of the specialist system’s return, players are limited to teaming-up with just one AI recruit at a time in New Dawn – narratively justified by the smaller, postapocalypse population – but a number of fresh faces should make for some fun pairings. In addition to Nana, Nick and Kim Rye’s now-17-year-old baby girl Carmina can be recruited, as can new Fangs for Hire Horatio and Timber. The former is a boar capable of mauling multiple targets in one sweep, while the latter’s a canine whose cuteness is matched only by his ability to treat a goon’s throat like a chew toy. 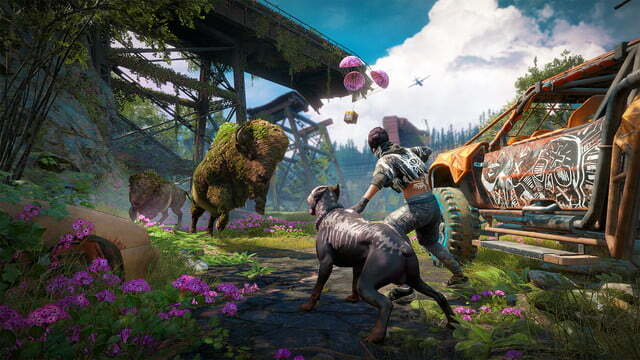 Fans who hated leaving Far Cry 5′s Boomer in the dust will also appreciate the fact dogs can finally ride shotgun in New Dawn. Far Cry 5‘s Pastor Jerome, as well as series’ man-child Hurk, will also be available to fight by your side. Upon laying waste to swarms of Highwaymen and collecting plenty of loot, the player steering our preview rendezvoused with the chopper and left Louisiana for Hope County’s Prosperity, the previous location of John Seed’s ranch. Once the sprawling estate of the crazed cultist, the land now serves as a modest safe haven where players can regroup, craft gear, and upgrade weapons. In this case, the resources brought back from the expedition were leveraged to buff the protagonist’s saw blade launcher; the power tool-turned-lethal-weapon that could previously spit out a single blade was now capable of shooting a trio of deadly discs simultaneously. Based on our in-depth demo of New Dawn, it seems the game’s positioned to work as both a standalone adventure, complete with new story elements, environments, characters, gameplay mechanics and systems, as well as a sequel with plenty of cool call-backs to Far Cry 5. 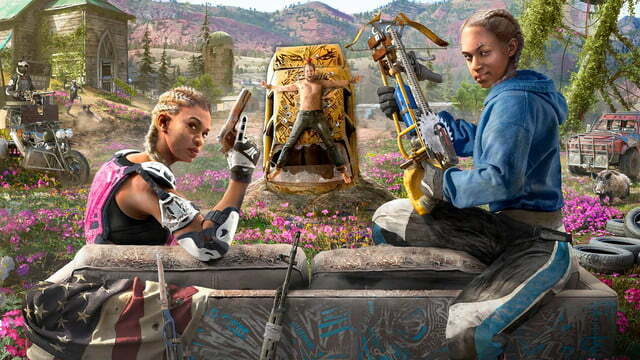 There’s still much to learn about this chapter, including details on its antagonist twin sisters Mickey and Lou, but if our promising peek – and New Dawn‘s appealing $39.95 price point – are any indication, we’ll be heading back to Hope County come February 15th.